With the aid of our proficient team of professionals, we are engaged in rendering OHSAS Certificate Service. Our OHSAS 18001:2007 certification is offered to companies with a large work force involving manual and heavy work tasks and high risk work environments. The certification defines the health and labor protection system of an organization as specified by internationally accredited certification bodies. 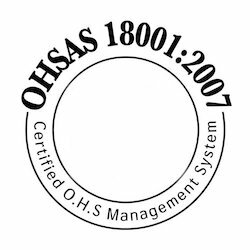 The OHSAS 18001:2007 certification offered by us confirms that the organization is pro actively protecting the health and safety of its employees and stakeholders. We can integrate this certification with ISO 9001 and ISO 14001 for environmental management systems. Looking for OHSAS Certificate Service ?